This level has medium difficulty For this level try to play from left part of the board where more candies available to play and make special candy. 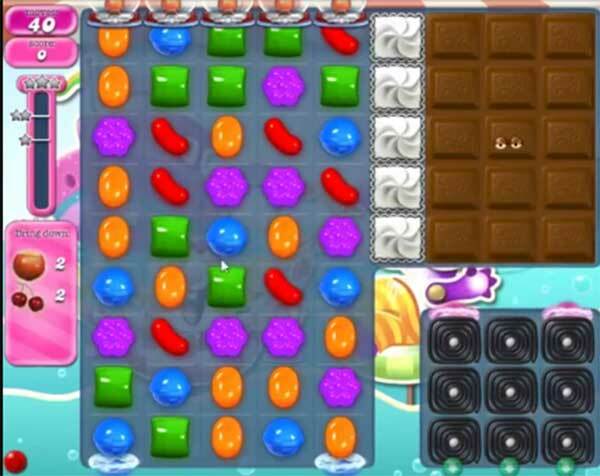 Combine special candies to each other to break the chocolates and blockers that are in right part of the board. Or play near to ingredients to take them out from the board. Come on king this level is the pits. This level is the pits. At this level 5 weeks and can’t get through it ,soon giving it up!!! Why is it that everytime someone has a terrible problem passing a level, all we hear is that they’re giving it up! You’re not going anywhere, this game has us addicted and imprisoned in our own little neck of the woods. I’m on level 1038 candy crush saga, and on level 929 candy crush soda. Although I do get to the point where I just can’t seem to pass a particular level, I just put the phone down for a couple of days. Another thing, I have spent exactly $36.00 on both games ever since I started playing. I take my time and eventually get past that level. This level is impossible !! Cannot get them to right hand side even using the frog. Even using boosters I cannot even come close to passing this awful level. It is not fun just frustrating. Fix it. This is a stupid pass level about to stop playing candy crush for good. I have been playing for years now and never received the bonus on the daily spin and have talked to several people who also claimed they haven’t either. Is this fixed too? Why are these levels so hard to pass. I’m the last if my friends still playing , it’s getting boring and losing interest too. is the pits!! Definitely rigged! It’s doing my bloody head in. I had the jackpot only once since the very beginning. I agree I have never got the bonus either why I ask. Love the video where the ingredients fall into the correct columns except for one. All mine tend to fall into the other columns & require moving so I never get the chancde to get the game out. I’ve used quite a few gold bars to purchase hands & extra moves all to no avail. Hope the computer lets me win soon! Again a sh** level. A shame losing so much time. Time to do other think. This level is impossible. Been at for days and days. I get down to needing only one more fruit and can’t move it over. Not fun. Ready to quit Candy Crush. I’ve played the game for 3 years and I’ve won the bonus round 2 times. Definitely fixed where we can’t get bonuses. Stops on Lollipop most times. Cheating us, fixed to not stop on bonus. Yes, funny how on sample play, the fruit just glides down the sides. Hate this level. Why do we waste our precious time here!!!! Frustrating not even getting close after days of trying. Also agree neva had a jackpot i suspect its cos i refuse to spend money on candy crush! I have been on the level for seemingly weeks. It is very frustrating. I have gotten one jackpot many months ago. I have never spent a cent on the game. This level is horrible AND impossible! I’m done with candy crush. I agree with most of the above: I have never got the jackpot, Never, the odds should be the same as the others! Level 1038, IMPOSSIBLE…it wouldn’t even be worth it to buy all of the “helpers” they just won’t go over there…… I’m lucky to get one set of cherries off and one buceye….guess I will be quiting if I do’t get past this this weekend. Like above says, it’s very boring when you can’t win occasionally! HORRIBLE LEVEL!!! Been a month now. Not even close to solving……. This level is jinxed on purpose. Refuse to spend any money for extra moves. Levels this hard take the fun out of the game. I have friends who passed it so I know it can be done. No jackpot ever for me either. Finally got me king. 2 months on this with not getting close. Throwing in the towel on this one. Really boring, doing this level over and OVER AGAIN. I never seem to get the ingredients in the right places, just a difficult level and I do not see why it should be this difficult to pass. Let’s make it a little easier to play, or you are going to lose a lot of players that are just fed up. Even watching the tutorial a couple of time now, it just does not make sense. Impossible and boring. Never hit the jackpot!! I am ready to quit this game!!! It can be done, because I know people who have, but I am clueless, and seriously am going to quit. Totally over this game and finding it totally boring. Have watched the video twice and it makes it look so easy but it never works that way!!! Ready to give it all a BIG miss!!!! I’ve been on this level for days, and haven’t even come close! I like a challenge, but this is stupid hard! I’ve never got the jackpot on the bonus spin either! I got this level in 4 tries. Forget the chocolate and the frog. Concentrate on bringing the fruit down in the rows with the teleports. Fruit comes down on rows 37, 33, 29 and 25 so leave a vertical move in the teleport rows for those 4 moves so the fruit releases in the right row. If a fruit is released in the wrong row, you may need to use a hand to switch it. Then work on getting striped candies, wrapped candies, color bombs, etc. and combine them to make big moves on the board. This will break up the black sections in the box on the bottom right. Your fruit will then fall because there is room for them in the box. Good luck! May be the band of cc for me. This one is rigged for sure. No way to get them down no matter what you do. I was on my phone and stopped here. Got my iPad started all over and things were feat I was getting tons of infinities and chakpllenges. Now I got a new iPad. I logged in cause I didn’t want to start all over. Big mistake. I’m back to where I was on my phone and no bonuses. Just the useless wheel. How do I go to where I was on my first iPad? Why can’t we just skip a level? This game is a cheat. Usually I can figure a level out after 4 or 5 tries. Levelm1038 is impossible even after looking at the cheats and hints. I can’t understand after reading all the above comments, why you would continue with this level. Why would you want users to get fed up, have it not be fun any longer and quit playing CC. Obviously not worth it to King that people stop playing! Did this level first time, I really did. Just line the fruit in right and left portal. Use frog to break liquor ice. Had moves left. What a high.